How Do You Reduce Outside Noise With Windows & Doors? 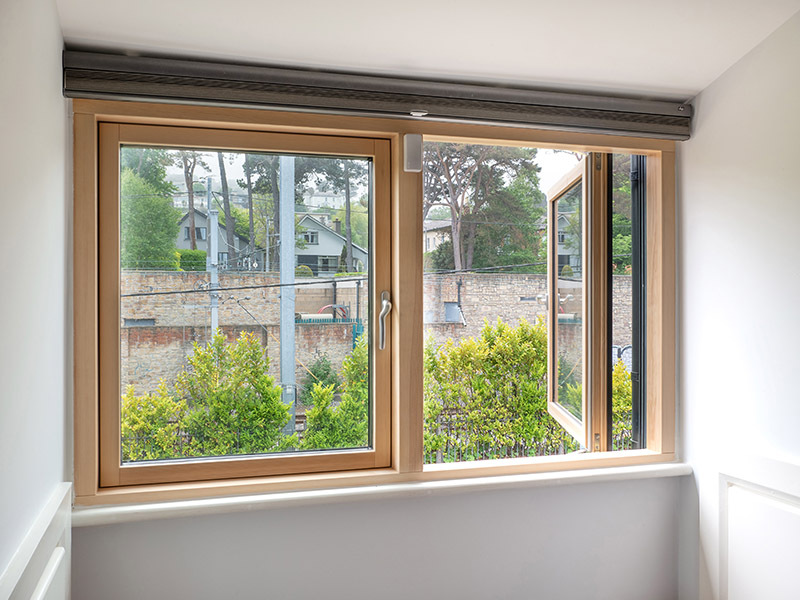 A common misconception is Triple Glazing alone will drastically reduce outside noise. 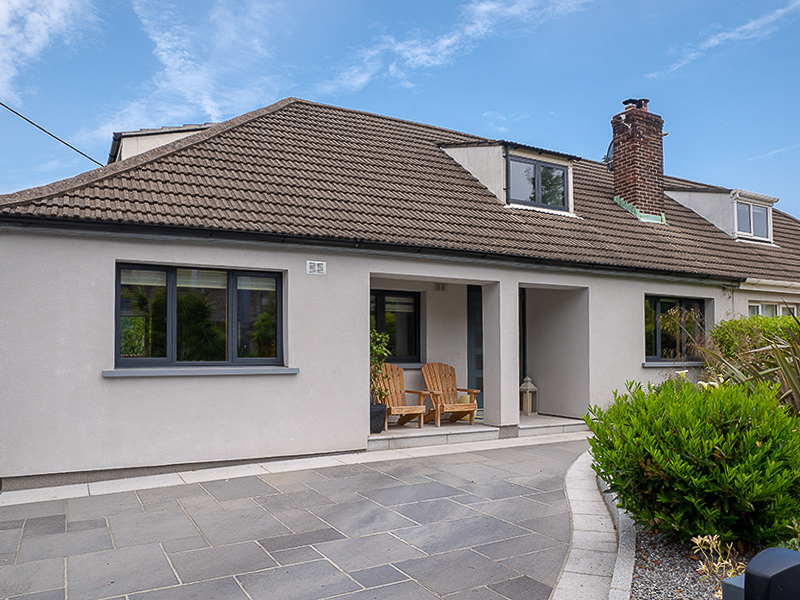 Located near Dalkey Dart station sits this beautiful stylish semi-detached home. The client felt that it was time to replace their old worn-out windows with a high-performance and modern styled window solution. 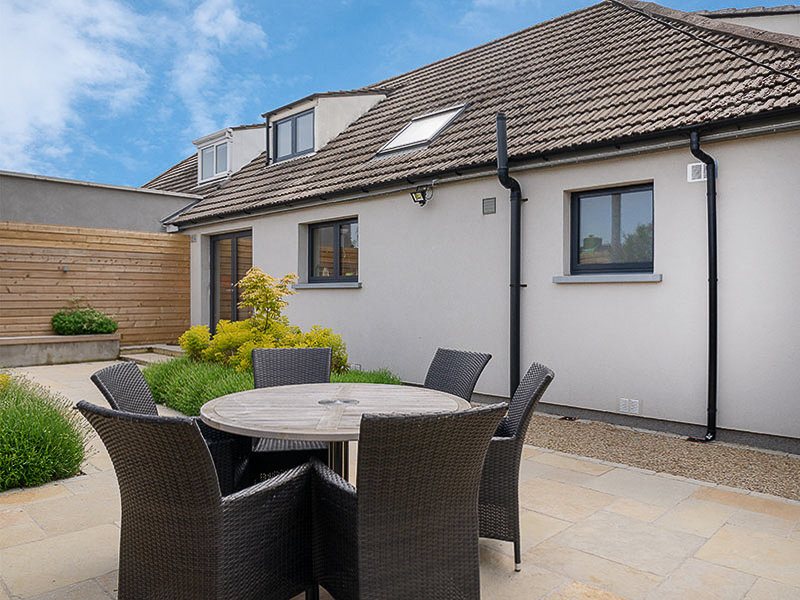 Originally this home featured white double glazed pvc windows which presented many troublesome problems such as poor energy-efficiency and overall comfort. Being located near the Dart line also meant that noise was a common nuisance for the client to the front elevation of the home as the windows weren’t correctly engineered to reduce sound transmission. The client fell in love with Signature’s Near Passive Standard Windows as they offered both slim modern designs and high-performance ratings. The use of a bare wood interior allowed the windows & doors to become a decorative feature for the interior design of the home. The natural grain lines of the non-finger jointed pine wood offered a minimalistic appeal that complements the interior décor. 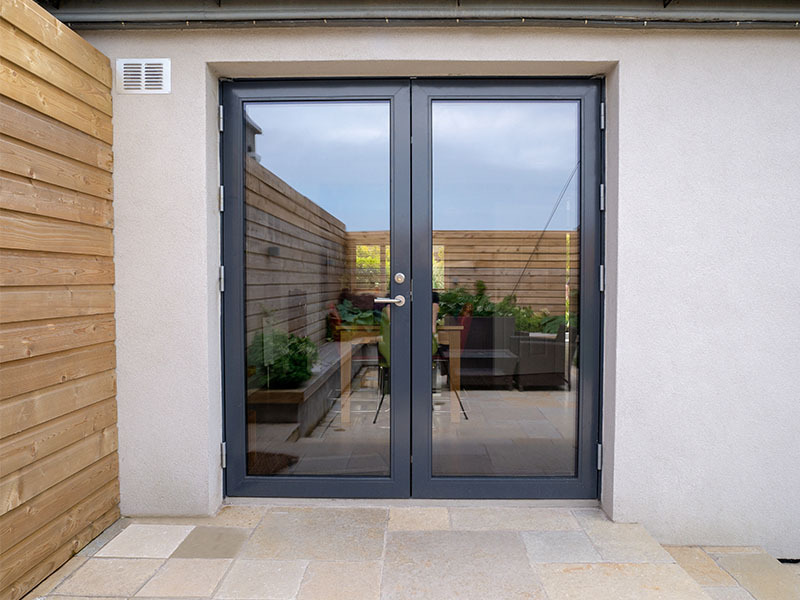 The aluminium cladding meant that the client would benefit from a virtually maintenance free exterior and aesthetically stunning bare wood interior that won’t rot or decay. The wide range of colour choices also gave the client the design freedom to choose the exact style that they had envisioned. Reaching a high-acoustic performance rating was central to this replacement project due to being located near the active Dart line. The use of wood in the windows allowed the sound waves to be naturally absorbed which the client previously couldn’t achieve with pvc. However, the glazing also required special acoustical engineering by the Signature Design team to fully achieve the desired performance rating. It is a common misconception that triple glazing alone will drastically reduce sound transmission in noisy areas. In order to accommodate the client’s acoustic performance needs, Signature’s design team specially engineered the glazing to achieve a maximum STC rating of 44db and a minimum of STC 38db throughout the windows & doors used in this project. An STC rating measures a material or partition’s sound transmission loss. The higher the STC number, the better the noise isolation. A good rule of thumb is if there is a change of +10 dB in your windows, outside noise should be cut in half. The average STC rating of high quality double glazed windows would be around 32 db. This meant that Signature reduced the outside noise in half without compromising on the overall slim contemporary design with thicker materials to achieve a better STC rating. The in-house Architectural department advised that the triple glazing should be configured with a glass thickness of 6/4/4 mm and chamber depth of 16/18mm between the panes. This drastically helped increase the STC rating as the sound wave frequencies would bounce off the various sizes and spacing between the glazing. If the glazing and chamber depths were the same sizes the sound waves would pass through the window with ease. 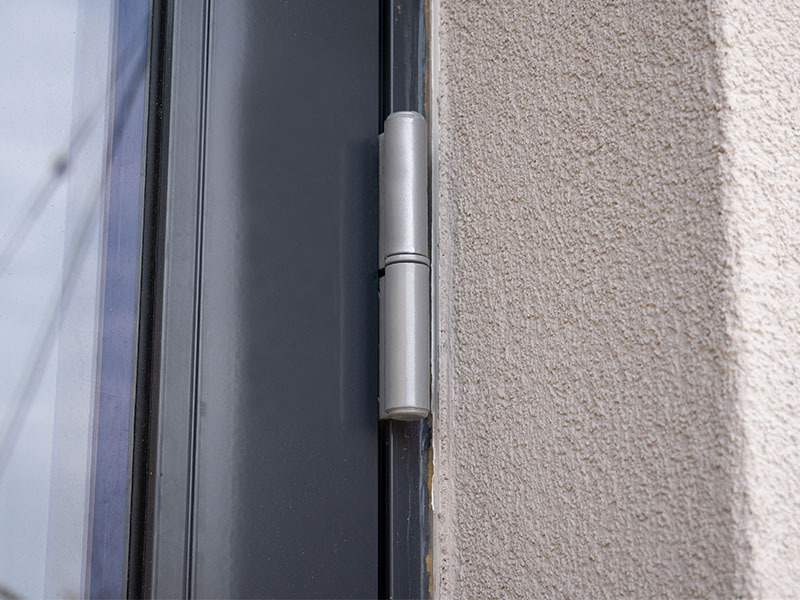 The tight weatherstripping found in the Signature’s Near Passive Standard Windows also boosted both the airtightness, watertightness and acoustic performance. The client had specified for their windows and French door aluminium cladding colours to be factory painted in Graphite Grey (RAL 7024). 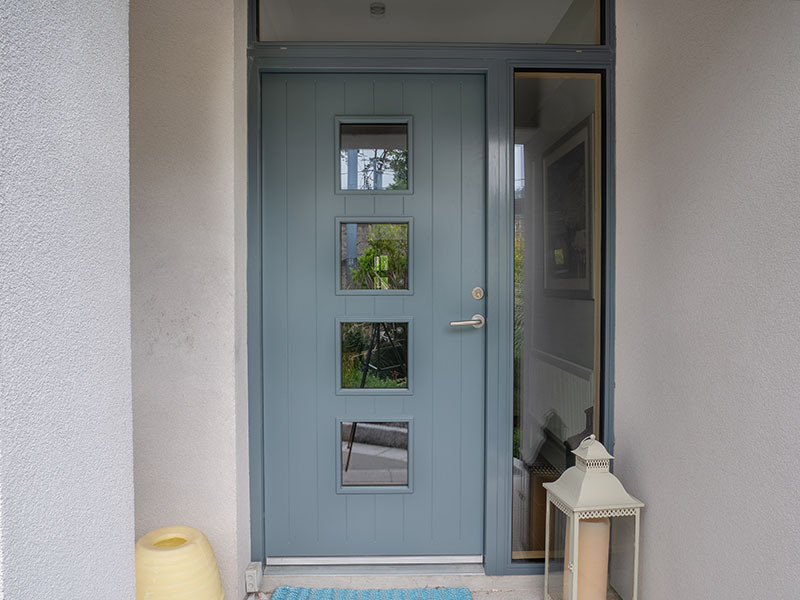 The front entrance door was factory painted in Blue Grey (RAL 7031). These grey colours contrasted stunningly with the grey-white façade of the home and embellished a clean contemporary tone that the client had envisioned. 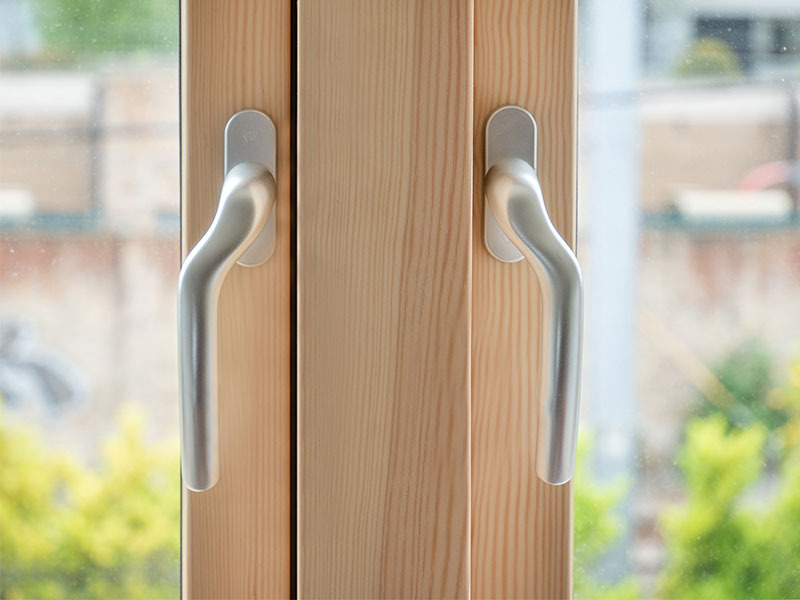 The interior wood of the windows & doors was specified as non-finger jointed pine with a clear varnish finish. The window and French door hardware were finished in a satin chrome while the front entrance door featured a stainless-steel Level handle. 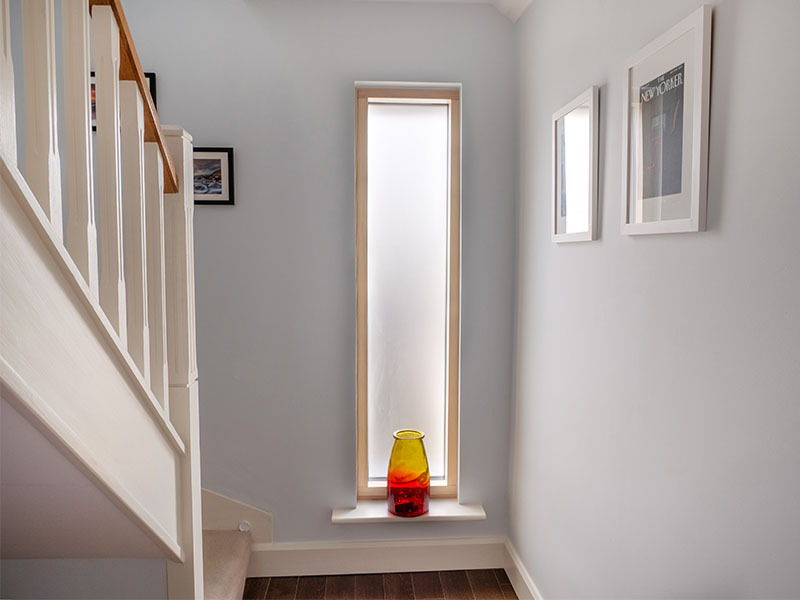 Tempered glazing was applied to the fixed window in the Hallway and the front entrance door as to satisfy Irish building regulations. 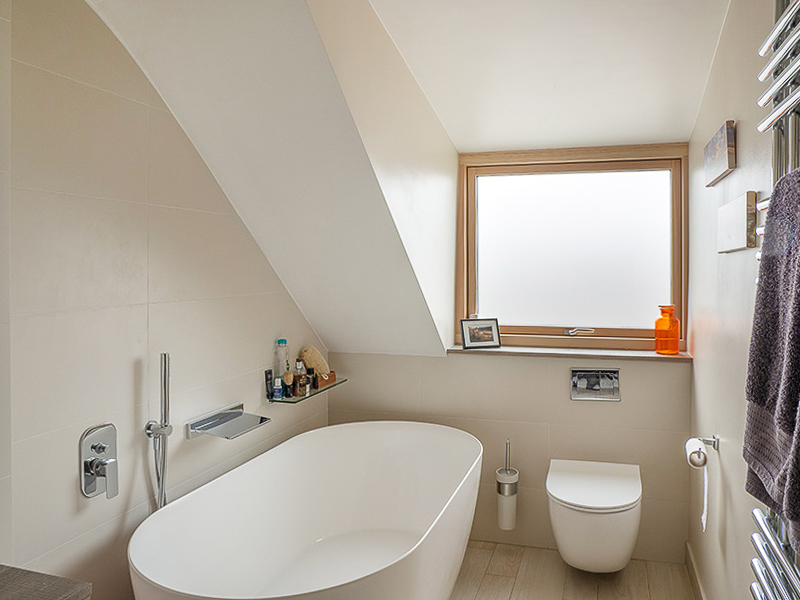 Obscure glazing was specified for certain rooms in the home such as the bathrooms to allow for privacy. 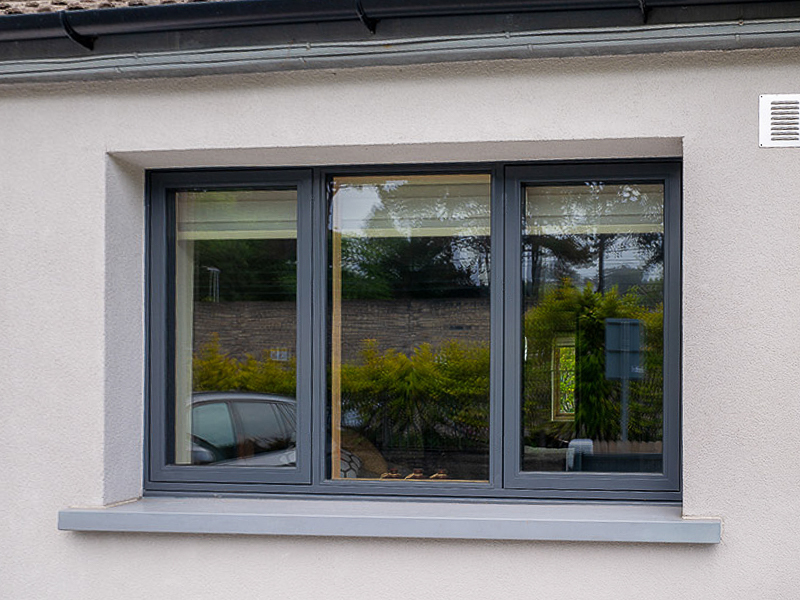 All fitted glazing featured Low E II coating with Argon gas to aid in energy-efficiency performance. 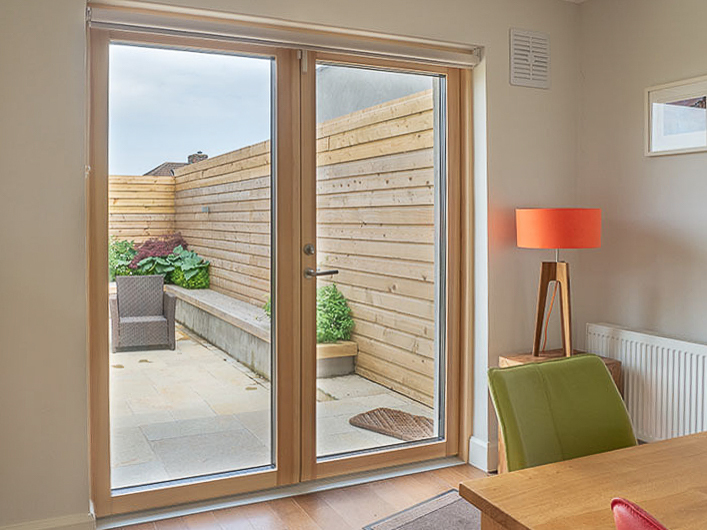 So Why Opt For Next-Generation Windows & Doors? 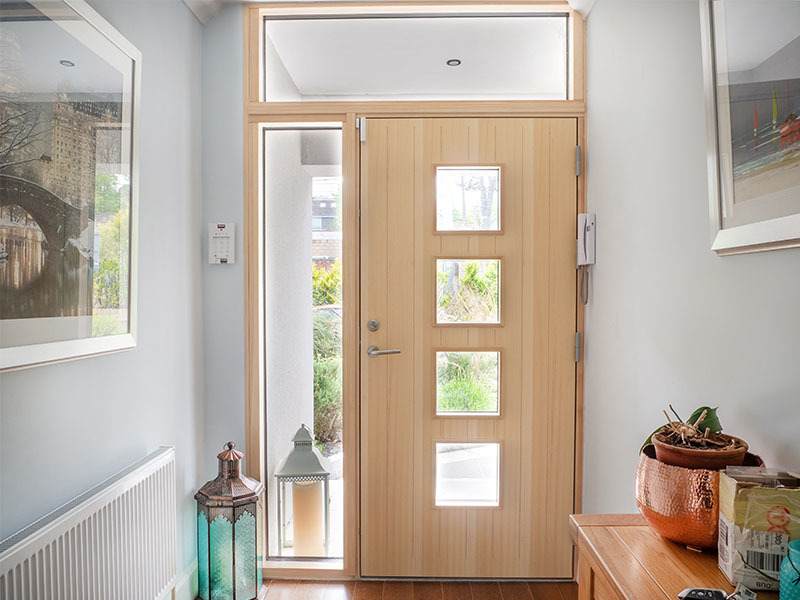 A clean and slim window & door design was maintained throughout this home with next-generation performance benefits that the client will yield for years to come. Want To Learn More About The Next Generation Benefits Of Signature’s Near Passive Standard Windows? Click on the link below to get in touch with us and our sales department would be more than happy to take you through the features & benefits. Start your pdf download by clicking on the button below. 1 Out-Swing Double French Door. Non-Finger Jointed Pine Wood With A Clear Varnish Finish. Aluminium Cladding With Graphite Grey (RAL 7024) and Blue Grey (RAL 7031). Satin Chrome French Door Handle & Hinges. 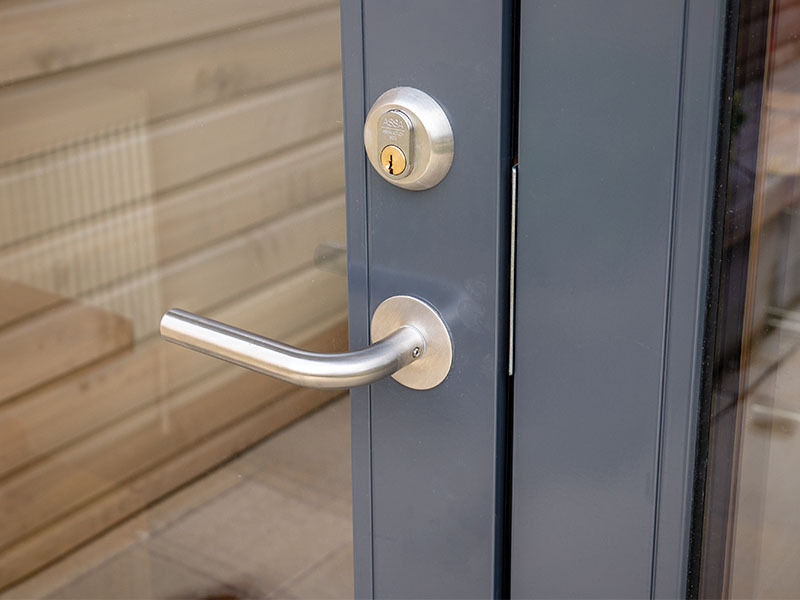 Stainless Steel Entrance Door Lever Handle. Triple Glazing With Low E II Coating and Argon Gas. Tempered Glazing in Accordance with Building Safety Regulations. Glazing Thickness of 6/4/4 mm and Chamber Depth of 16/18mm Between the Panes.